Charming renovated apartment with Air Conditioning in living room and both bedrooms to keep you cool during summer and warm during a winter, roof terrace with barbecue, shared big swimming pool with green grass sunbathing area, big balcony to enjoy gorgeous sunsets with galss of wine. Fibre optic internet 100MB/S, 140 English, Spanish, German, Rushian and French TV Channels. This is a charming apartment with a private roof terrace and balcony within the large urbanisation Villa Martin, and is located in the beautiful and quiet residential area of Pinada Golf II. 10 mins drive to the best beaches on the Costa Blanca, walking distance to the golf course "Campo de Golf Villamartin", and VillaMartin Plaza where you can find numerous bars and restaurants. The apartment has just been completely renovated. It features a living / dining room, fully equipped kitchen with all necessary appliances and utensils, one double bedroom with double bed, one double bedroom with two single beds, utility room with washing machine. There is a sofa bed in the living room to allow a total of 6 people to sleep comfortably. 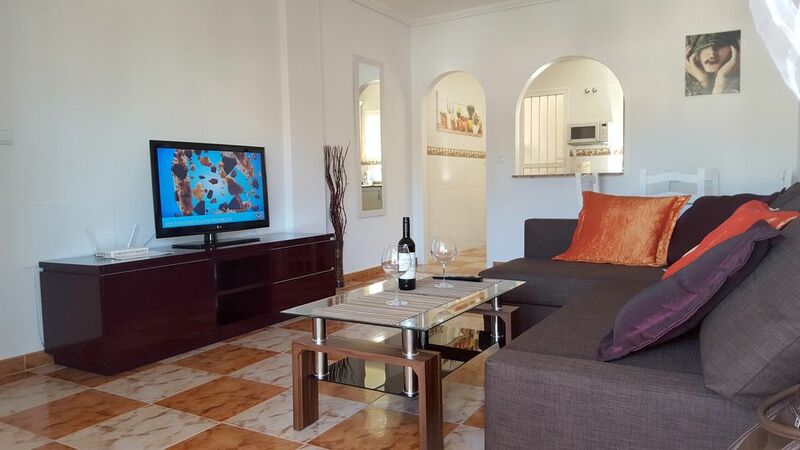 The apartment offers free High Speed WiFi, air conditioning, flat screen TV with 140 Channels, washing machine. Free street parking is available. Very happy to host Lorraine and her lovely family. Very punctual and very easy and good communication. All very polite, left property very tidy and clean. More than happy to host them again.